The cantaloupe melon is also commonly called the muskmelon, I suppose for the musky aroma that it gives out when ripe. In some parts of the world, it is also known as the rockmelon, perhaps for its rough skin that looks like a rock. It belongs to the curcurbitaceae melon family, along with cucumbers, gourds and pumpkins. The cantaloupe is round or oval-shaped. The skin looks like it has been wrapped in a net. The orange colored flesh is soft, succulent and sweet with a similar texture to the honeydew. Although available throughout the year, cantaloupes are at their best when in season – from June to September in the Northern Hemisphere. Although a common fruit in shops and on tables around the world, the nutritional benefits of the cantaloupe melon are not well known. 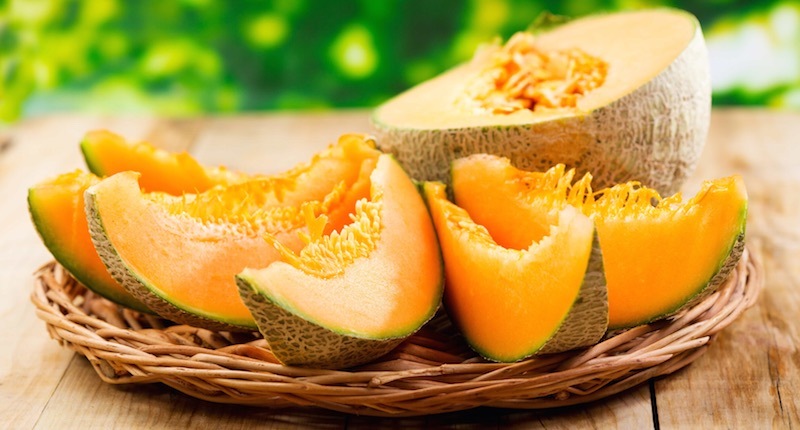 Cantaloupe melon is packed with nutrients and yet surprisingly low in calories. Cantaloupe melon is highly concentrated with beta-carotene, folic acid, potassium, vitamin C and dietary fiber. Cantaloupe melon is also one of the very few fruits that has a high level of vitamin B complex—B1 (thiamine), B3 (niacin), B5 (pantothenic acid), and B6 (pyridoxine). Cantaloupe melon is rich in anti-oxidants that can help prevent cancer and heart diseases. The high amount of beta-carotene and vitamin C (anti-oxidant) makes cantaloupe an excellent fruit in helping to prevent many degenerative diseases. I get excited just thinking how much more my body can absorb these precious nutrients when I drink cantaloupe juice. Is an anti-coagulant: A unique compound in cantaloupe helps decrease the viscosity of the blood, hence preventing the abnormal formation of blood clots in the cardiovascular system. Can delay arteriosclerosis: Regularly consuming vitamin C retards the development of hardening of the arteries. Prevents cancer: The high vitamin C content in cantaloupes acts as an anti-oxidant, protecting cells from damage by free radicals. Regularly drinking juices high in anti-oxidants keep cancer at bay, especially against intestinal cancer and melanoma. Reduces the risk of cataracts: The natural vitamin A from the beta-carotene in cantaloupe juice lowers the risk of cataract and helps maintain healthy vision. Lowers cholesterol: Cantaloupe juice is high in antioxidants, been proven to fight the oxidative stress that is the main culprit in oxidizing the LDLs in the blood. Lowers high blood pressure: Potassium in this rockmelon helps the body to excrete sodium, thus bringing down high blood pressure especially in those with salt-sensitive hypertension. Strengthen the immune system: The high vitamin C content helps to stimulate white cells to fight infection, promoting a stronger immune system. Improves sleep: A special compound in cantaloupe relieves the nerves and calm anxieties. A help for insomniacs. Reduce PMS symptoms: For women, drink this wonder juice around the time of menstruation and it will help reduce heavy flow and clots. Prevents muscle cramps: A deficiency in potassium can cause muscular cramps and greater susceptibility to injury. Drink cantaloupe juice to prevent these. Healthy pregnancy: Cantaloupe is high in folate (folic acid), which prevents neural tube defects in infants. Promotes healthy skin: Promotes synthesis of collagen and skin which will result in a healthy glowing complexion. Helps in quitting smoking: The high concentrations of naturally occurring nutrients and minerals found in cantaloupe juice provide a synergistic combination that helps the body recover from nicotine withdrawal in people trying to quit smoking. Smoking also depletes vitamin A in a smoker, but cantaloupe juice can help replace this with its high beta-carotene content. Calms stress: When going through a stressful period, the potassium content in cantaloupe juice helps to re-balance and normalize the heartbeat. This in turn sends oxygen to the brain and regulates the body’s water balance. Reduces water retention: Muskmelon juice helps your body excrete excess sodium, thus reducing water retention – especially useful for pregnant women and people wanting to lose weight. Choose cantaloupes that are firm but not hard. Reject over-ripe fruit that is yellowing and soft. The melon must be heavy, which means it is full of juice. It should have a fragrant, musky smell. As melons are grown on the ground, they come into contact with dirt and may even become contaminated with human or animal waste. Wash and scrub your melon under running water before cutting. Leave a firm cantaloupe at room temperature for a few days till its flesh is softer and juicier, then place it in the refrigerator to store. When ready to be eaten, cantaloupe have a sweet, fragrant smell. Once cut melons should be consumed immediately or wrapped and stored in the fridge. Remember the simple rule of always eating fruit as fresh as possible. When juicing melon, add the rind as well. You can also add the blended seeds with a little pineapple juice and serve as a delicious nut milk drink. Can I eat the seeds of cantaloupe? Yes, you can eat cantaloupe seeds. In fact they are packed with vitamins (A, B1, B2, B6, D, E, K and choline) and minerals including iron, calcium, magnesium, potassium, manganese, phosphorus, selenium and zinc. When juicing melon, you can also add the seed – I often blend separately to ensure they are well ground. Melons grow just like a pumpkin. The melon plant sends out a rambling vine that covers the ground. Flowers grow on the vine, that when fertilized grow into melons. Gardeners will often put a stone or tile under each melon to ensure that it grows and ripens without rotting on the damp ground. Most variety of melon need a hot climate to grow and ripen. When are cantaloupes in season? Cantaloupes can be found year round, though they are in season in the northern hemisphere from June to August.